A group of us from the Little Wars Revisited 54mm Wargames Forum met up in Woking for the second LWR Forum Games Day on Saturday March 16th. The idea of the day is to bring a group of people interested in 54mm wargaming together, put on some different games so that people can see what others have been working on and chat to some fellow enthusiasts. We managed slightly more people this year with the furthest traveller coming down from Fife. Eric Kemp and his son Jonny put on a Schleiswig-Holstein skirmish game using figures converted from ACW ones and using their own rules. People arrived at 9am and after introductions, coffee and some chat, we started playing the first games around 10am. There was a break for lunch in the church cafe and then we swapped around to play another game in the afternoon. After packing up, 5 of us went for a meal in a local Turkish restaurant and then onto the pub for a drink and more chat about toy soldiers. Everyone seemed to enjoy the day. “A Gentleman’s War” is a new set of rules that Howard Whitehouse has been working on for a while. They are shortly to be published as a book but I used the playtest rules from April 2018 for a test game. AGW is a deliberately old school set of rules for playing with toy soldiers on a table top. It used card activation, quite a few dice and single figure removal. The Prussian setup at the start of the game. AGW uses 12-man infantry units, 6-man skirmisher units and 6 man cavalry units. Guns are crewed by 4 figures. The game uses activation cards which determine which side moves and how many units it can move (it is possible to brigade units together) – you can also have hold cards in your hand which enable you to interrupt the other person’s go before they have taken an action. Shooting is fairly straightforward, rolling a D6 for each figure in the first two ranks and the number needed depending on range. Hits can be saved which is modified by cover. Close combat is a little more complex and there are a number of factors which determine whether one side has an advantage or not. This affects the number you need to roll to cause a casualy. I did like the fact that casualties are counted and that determines the winner of the melee and THEN the outcome determines what number you will roll to save your casualties. People running away are more likely to bayoneted! Terrain does disorder units which restricts what you can do and we have too much terrain on the table for this game – I will run the LWR game on a wider table which should allow for freer movement. I also got the melee rules wrong – partly by reading a table incorrectly and also for a couple of other reasons. This seemed to make skirmishers in a building too strong but in retrospect I think that they are about right with the correct rules! Anthony and I tried out the Shambattle rules this week using my LWR 19th Century figures. The rules were originally published in 1929 and draw on some of the ideas on H G Wells’ Little Wars with some other changes. The interesting thing about the game is that the table top represents two countries divided by a river with 3 towns each and the game involves attacking the other country. The version of the rules we used are the set published and enhanced by Thor Shiels (who sadly died late last year) which have some suggested amendments and updates. There are 3 levels of game – Lieutenant, Captain and General – we played the middle sized game. The Captain’s game involved 25 figres a side plus a gun and 2 crew, of which no more than half could be cavalry. We settled on 6 cavalry, 18 infantry, an officer and a gun with crew. The enhanced game includes victory conditions and Anthony was charged with capturing both the east and west bridge and holding them for 3 turns, while I had to capture the opponent’s frontier town and hold it for 4 turns. The photo shows the setup at the start of the game. The game is very luck based as there is no shooting, just combat and artillery fire. Combat involves rolling a D6 for each of your own men and on a 1-3 they die, 4-6 they survive. My die rolling was fairly poor and my men died in droves.. Artillery fire only hits on a 1 (and only Anthony managed to hit all game) but all figures under the arillery template (which could cover 4-5 men) are killed. Eventually, Anthony eliminated all my troops and won the game. The General’s game with some additional terrain, 40-50 figures a side and the use of field hospitals which enable you to recover wounded troops looks the most interesting variant. Not something I can see us playing as regularly as The Portable Wargame or other rules but something that makes a nice change of pace and scale. The 2019 LWR forum 54mm games day is booked for Saturday March 16th 2019. This will be a day of playing 54mm games with fellow enthusiasts and talking about 54mm gaming. Please let me know if you are interested in coming along and please advertise the event if you have a blog devoted to 54mm gaming. Anthony and I met up in his games room to play through another Zulu War era game using his 54mm Little Legion collection and the Portable Wargames rules. 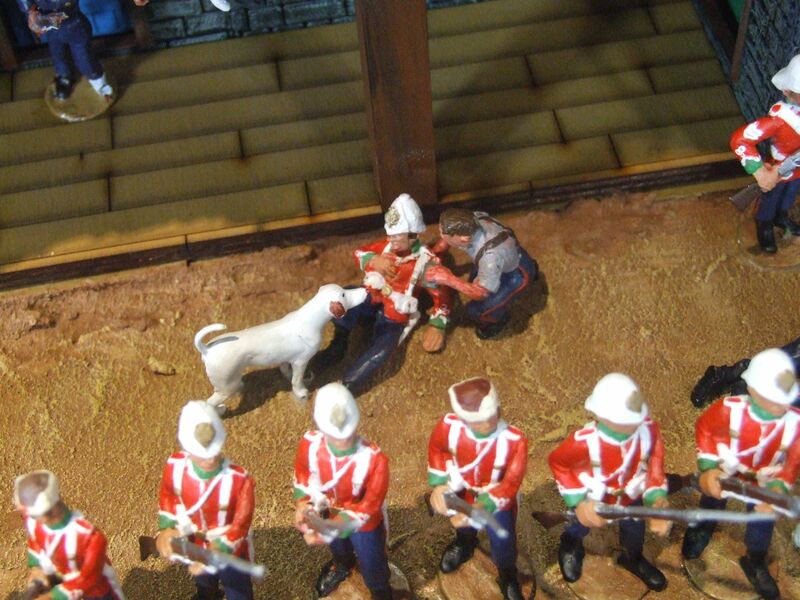 The scenario for this game was again taken from the Battle Cry set of Zulu War scenarios and based on the battle of Hlobane. The basic setup is shown above. Due to limitations on the tiles that Anthony has available, the area surrounded by hills represents the plateau and the river can be ignored… I am currently producing some more tiles for Anthony so he has more flexibility in layouts. In the original battle, the British eventually realised that they were heavily outnumbered and withdrew. Battle Cry simulates this through the use of cards that enable units to be withdrawn. This is difficult to do with a ruleset such as The Portable Wargame as all the units have freedom to move each turn. With this in mind, we decided to play with the normal “eliminate 2/3rds of the opposition” rule which meant that the British had to kill 10 units and the Zulus had to kill 6. Anthony contemplating the British position at the start of the game. The British had 2 artillery pieces (rockets in the actual battle) and these were to prove quite effective with the artillery removing one zulu unit on the very first turn. The Zulus had 4 units per table side that could come on with a roll of 5-6 was made each turn for each unit. They came on in dribs and drabs over the course of the game. We used the instant death rules for elimination and initially rated the British as Elite and the Zulus as raw, but realised quite early on that this was too extreme a difference and adjusted to rating everything as average after a number of my zulu units were quickly eliminated in the first few turns. In 2015 we acquired the “All the Queen’s Men” colonial ranges from a local collector. I am now pleased to say that we have now acquired all of the rest of the AQM ranges including the vast Napoleonic, Bands, Crimean, etc sets. The last of the moulds will arrive today and I expect to collect the 20+ boxes of masters over the next week or so. It will take me a while to sort and catalogue all the moulds and check through all the masters to make sure that we can produce all the sets on offer. In particular, a lot of the older horse moulds will require remaking. I am in the process of putting together a full price list for the ranges which will include prices for painted sets and castings. For the vast majority of these sets it will be the first time they have ever been available as castings. I don’t have the moulds for the resin scenery for the vignette sets but will be recreating these in due course to be able to offer such things as the hougoumont sets and the storming of Badajoz. Please inquire if there anything you are particularly interested in and I can look out for that set as I sort things. This does mean I will finally be in a position to produce the Imperial German sets that I know people were interested in. This is part of a change in direction for as I have now also sold all of my wargames figure ranges that I produced through Black Hat Miniatures. The 15/18mm ranges will go to their new owner in the middle of next week. I still own and will be retailing and distributing the Coat D’arms range of acrylic paint but this will enable me to concentrate more on the 54mm ranges. Anthony and I met up in his games room to christen the new gridded battlefield he had ordered from me and I had recently delivered. This is based on the style of battlefield I created for the Portable Wargame demonstration game but with 5″ tile rather then the 100mm ones I used. He gave me a copy of the Battle Cry map for isandlwana and we converted that to a grid from the hexes used in Battle Cry. Anthony contemplating the battlefield and the initial British and Zulu deployments. The game was played using the Portable Wargames Rules, the sudden death variant, as usual. We rated Zulu units as raw and the British as Elite. Each side had 3 commanders. The British are heavily outnumbered and there surrounded on 3 sides. The river is fordable but a unit has to stop when it enters the river, melees at -1 whilst in the river and can only move one square upon leaving the river. The game started with the British firing their gun and forcing a Zulu unit back a square (The Zulus needed a 5 or 6 to retreat rather than dying and I managed to roll a remarkable number of 6’s). The Zulus needed to kill 6 British units to break them and the British to kill 10 Zulu units. In the end, the game was very close with the Zulus getting victory having lost 8 units to the British – a number of poor British shooting rolls and the outflanking by the Zulus lost it for the British. It was a fun game completed in 1.5 hours. On Saturday March 10th a bunch of us from the Little Wars Revisited 54mm Wargames Forum met up in Woking, Surrey for a day of 54mm wargaming. The idea behind the day was to play a number of different games with different rulesets and see what other people did with 54mm wargaming and experience some new things as well as meet up with some people in Real Life for the first time. The venue was Christchurch, a church in the very centre of Woking. There were 5 games run on the day with people switching games between the morning and afternoon sessions. First up, I ran my game of The Portable Wargame by Bob Cordery using the same scenery, Little Wars Revisited figures and scenario that we had used for the Cavalier game. Anthony Morton brought along his ECW collection and and ran a game using the Pikeman’s Lament ruleset by Dan Mersey. Alistair Jack ran a North West Frontier scenario with the British rescuing a garrison from hordes of Pathans using The Sword and The Flame ruleset from Larry Brom. Eric Kemp and his son Jon ran a Napoleonic game using their own homegrown rules featuring a mass of Fench (160 figures!) assaulting La Haye Sainte against a few plucky British. We played a game in the morning, broke for lunch in the excellent church cafe downstairs and then played a second game in the afternoon. After clearing up a few of us retired to the local Turkish restaurant for an evening meal and more discussions of 54mm figures and wargaming. All in all, a fun day and something that I have already been asked about repeating next year. Anthony Morton and I attended the Cavalier Wargames Show in Tonbridge, Kent on Sunday 25th February. 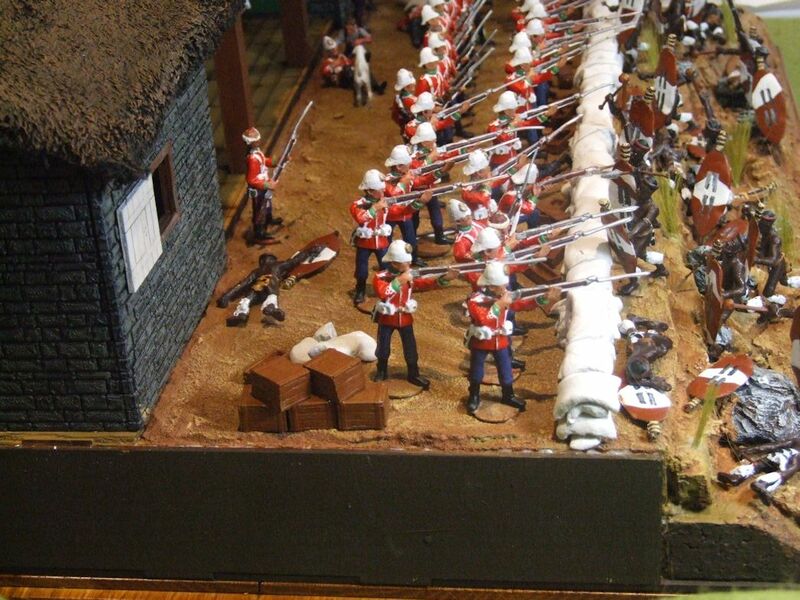 I had arranged for us to run a 54mm 19th Century version of the portable wargame to promote the Little Wars revisited forum, Black Hat’s range of Little Wars Revisited figures and Bob Cordery’s rules. We used my usual armies of British and German organised into 6-man Infantry regiments, 2 man cavalry regiments and guns with 3 crew. I made the board over a couple of days the week before the show by laser cutting a mix of 4mm,3mm and 2mm mdf into 100mm square tiles. Hills are represented by an 80mm square on the tile representing the hill top, rivers are 2 layers of 2mm mdf, roads are engraved into the tiles. The trees are simple, representative shapes on the edges of the tiles as are the fields and the town area. We ran 3 games during the day and had a lot of interest in the rules, the board and the figures so it achieved our all objectives. We also had a lot of interest in the Little Wars Revisited forum and the games day I have arranged for March 10th in Woking. I haven’t posted much as I have been extremely busy with work – both the wargames business and the Toy Soldier side. I have managed a few games but not managed to write them up. 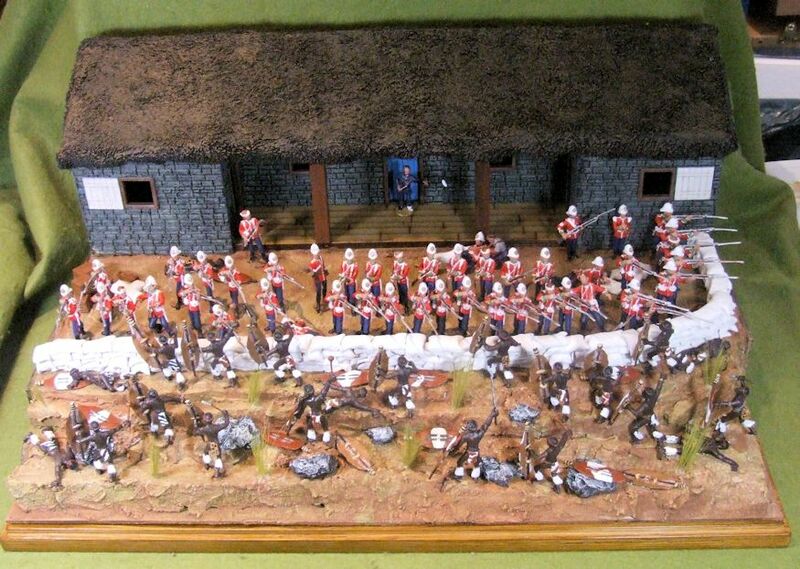 This was a commissioned piece requested to accompany a painting of the Defence of Rorke’s Drift. The diorama has 71 figures (and a dog) and is 22 inches wide by 15 inches deep, based on an oak base and supplied with a 4mm acrylic cover. It uses figures from the All the Queen’s men range with four additional new figures that have been added to the range just for this diorama. The hospital is made from a plywood shell with 3d printed stone texture added to the outside. The new casualty figures will be released as soon as I get a some photos sorted and uploaded. The hospital is the first of a range of facades and will be released as a kit and a fully painted item in time for the March London Show. If you are interested in commissioning a diorama please get in touch and we can discuss your requirements.